Superb apartment completely renovated and air-conditioned with double glazing, not overlooked. Located on the 2nd and last floor of a small building surrounded by a garden. Underground parking space available. Sea view from the 2 French doors of the living room, view of the hills from the French doors of the 2 bedrooms and view of the city from the kitchen window. The open-plan kitchen is new and fully equipped. It opens on a large dining room and living room with big screen TV. A 9 sq.m loggia is equipped with a gas plancha with fireplace. The large terraces are equipped with garden furniture and deck chairs. Located 200 m from the harbour, close to all amenities, it is also close to Collioure and the Port-Vendres beaches. In the area: 1 - the Côte Vermeille, a rocky Catalan coast, is composed of 4 towns: Port-Vendres (the county-town) Collioure, Banyuls-sur-Mer and Cerbère, last city before the Spanish border. Collioure, 2 km away from Port-Vendres, is a cultural and artistic city, source of inspiration for many artists. 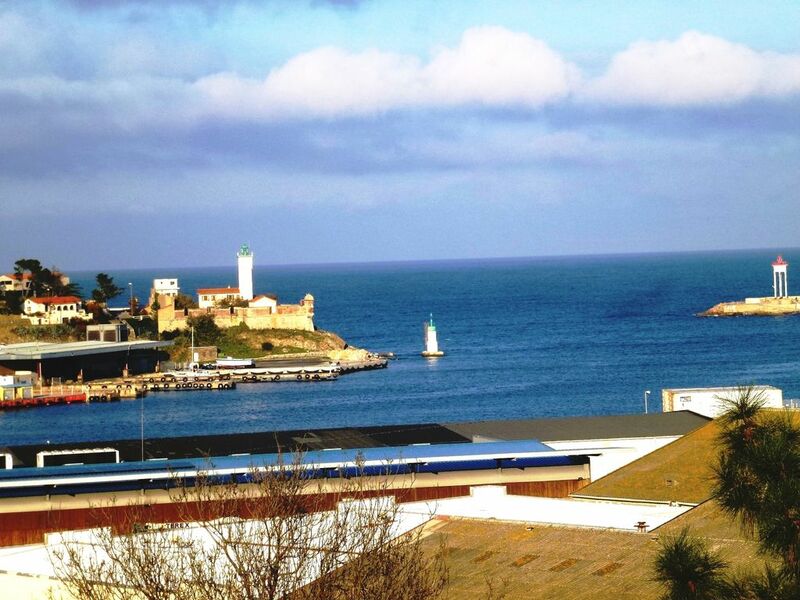 Banyuls-sur-Mer, 6km away from Port-Vendres, is a port that was strongly influenced by Aristide Maillol. Cerbère, 17k m away, a border city near Spain, owns the Marine Reserve. 2 - Pepignan, 30 km away from Port-Vendres, is worth the visit to see the heritage of the city. Around Port-Vendres: the Béar Cape is a must-see. The lighthouse, built in 1904, is 80 m above sea level and will offer you a stunning view. The Madeloc Tower, a former Visigothic signal tower built in 1285, offers a unique panoramic view on the Roussillon plain. In the heights of Port-Vendres, many forts are perfect for strolls with amazing landscapes. These sites can be accessed through the Route des Crêtes. Cosprons, with its Church from the 12th century, is a picturesque hamlet overlooking Paulilles bay. The beaches: 12 km away from Port-Vendres! Located 3 km to the south of the centre of Port-Vendres, Port-Vendres beach (Paulilles bay - RD914) offers 3 pretty sand and pebble coves where there are all the facilities to have a pleasant stay (sea kayaks, bar, restaurant). The Benardi and Usine beaches are supervised in July and August. Fourat beach is accessible but not supervised. Bathroom with large bathtub and separate shower. Washing machine, separate toilet with wash basin. The largest terrace to the east is about 20 sq.m and is equipped with table, chairs, deck chairs and a large electric shutter. Nice room where you can comfortably have your meals. Adjoining to this terrace, a loggia with plancha will be perfect for your barbecues. The other terrace, to the South, of about 15 sq.m and on which the bedrooms open, has 2 deck chairs. WE stayed in this beautiful, light and spacious apartment for five days and wished we could have stayed longer. It has been renovated to a very high standard and has everything necessary for a very relaxing holiday. The outside space is amazing, we ate all our meals on the lovely terrace, which opens out from the dining room, watching the coming and going of the boats in the harbour. There are a further two terraces (one is covered, with fully opening doors, if it gets too hot). Spoilt for choice. The kitchen is fully equipped, we found it a pleasure to cook and so easy. It is very peaceful, the only sound is the occasional bouncing of a tennis ball from the nearby courts. There is secure parking (garage) and just a gentle stroll into town. Port Vendres is a charming small harbour town, with supermarkets, fresh fish straight from the fishing boats and an excellent selection of restaurants. It's location is superb being close to the Spanish border and also the breathtaking Pyranees. Good for walking, sailing, swimming in the sea or simply relaxing with a good book. You can also catch the train into Barcelona or the yellow train through the Pyranees to Andora. The choices are numerous and you can make your holiday as busy or relaxing as you choose. We love travelling and have never returned to the same holiday destination before, but we do intend to return to this lovely apartment in Port Vendres. I would highly recommend it. Très bon accueil. Grand appartement bien équipé proche des commerces et transports publics. La casa es muy agradable y está muy bien equipada. Las vistas al mar son magníficas. Las habitaciones amplias y cómodas. El pueblo es muy bonito con un puerto agradable y unos restaurantes estupendos. Bien,mais literie un peu vielle ,pour étendre le linge un peu juste,lave vaisselle affreux..
Calme,la personne qui nous reçois est trés charmante..Plutôt bien situé .Dommage que le propriétaire manque d'attention ..un petit quelque chose de bienvenu aurait été sympa!! Merci beaucoup de votre appréciation sur votre séjour à mon appartement ce qui m'aide à toujours améliorer les conditions de location. Toutefois, je vous signale que les matelas ont été renouvelés en 2017. L'étendoir à linge fourni est certes un peu petit mais il y a un grand étendoir extérieur au rez de chaussée, pour l'immeuble, si celui de l'appartement n'est pas suffisant (draps,...). Pour le lave vaisselle, je ne comprends pas bien " affreux": c'est un Bosch relativement récent qui marche très bien...et la cuisine est bien mieux équipée que beaucoup de locations que l'ai connues. Enfin, en ne faisant pas payer la taxe de séjour, je crois faire un petit geste de bienvenue à nos locataires. J'espère que votre séjour a, malgré cela, été excellent dans cette belle région et que j'aurai le plaisir de vous accueillir à nouveau dans le futur. Nous avons passé un agréable séjour dans cet appartement avec nos deux enfants en bas age. L'appartement est au calme, lumineux. Les chambres sont séparés de l'espace de vie. Nous avons profité pleinement de la veranda ainsi que de la plancha avec le poisson frais du port. Il est bien équipé, tout le confort nécessaire est présent. La localisation est parfaite, elle permet de tout faire à pied. Si nous retournons en vacances sur le secteur, ce sera surement avec ce logement ! L'appartement est super : spacieux, propre, calme et très bien équipé. La vue de la terrasse est magnifique. Cerbère, 17k m away, a border city near Spain, is known for its Marine Reserve. In the heights, many forts, perfect for strolls with beautiful landscapes. 3 - 20 min from Perpignan with its rich historical and tourist heritage. About 25 km away from Port-Vendres towards Perpignan. Le tarif est à la semaine et varie en fonction de la saison. Un rabais de 10% est fait pour une semaine supplémentaire, sauf en Haute et Très Haute saison. Sont inclus: eau, électricité, TV et internet wifi, linge de couchage, de toilette et de cuisine, certains produits d'entretien,... La location commence le Samedi, à partir de 15 heures et se termine le Samedi à 11 heures au plus tard. La caution de 500 Euros est rendue le jour du départ si tout est en ordre.